I have been invited to join in the celebration of the Stamp Simply Birthday Challenge. Today is the 100th challenge and a reason to celebrate. There are 19 of us who are participating in the celebration, so you will get to see lots of beautiful designs today. I hope you can take time to sit back and enjoy them. You need to simply click on the links below to see them. Don't forget to leave a comment. Speaking of comments, if you leave a comment for me you will be entered into a drawing for some wonderful blog candy shown at the bottom of this post. Using Therm-O-Web Dimensionals, I added the flowers to the Fleur De Lis Pendant from Spellbinders which had been attached to a piece of DP cut with the Spellbinders Lable One Nesties. The sentiment was stamped using JustRite Birthday Wishes (without the border) and cut out with the Dahlia Nestie. I ran a piece of May Art's silk ribbon on top of the Madeline K&Company Paper which is cut 5.5x5.5 (shown in this weeks sale) and attached it to the same size of Neenah cream cardstock. It was finished off with a beautiful deep purple silk bow made with the Bow Easy. Last year for Christmas, I dried several ferns and then I framed them. I stamped a nice sentiment on it and wrote a special letter to my daughter, granddaughters and Mom. They all told me it was the best gift they received. We all decided that this year we all are to make something from the heart. The idea I have had is to etch something for my "girls" this year. So, I needed to practice and I had this bottle that I thought would be a good starting point. This is my first etching project and I hope you can see it. I used my Cricut to cut out the Dogwood Flower on Vinyl and then I followed this tutorial. It is a very easy and quick process, the etching is completed in 5 minutes. 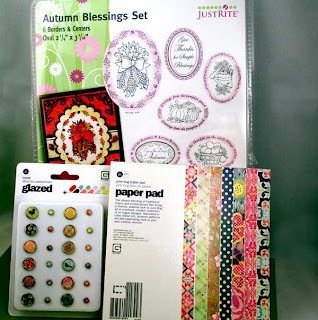 The winner will receive the new JustRite Autumn Blessings Stamp Set and the new Basic Grey June Bug Paper Pad with matching brads. Good news- if you are already a subscriber to my blog or you become one, I will include the wooden stamper to go with the stamp set. All you have to do is fill in your email address on the top left where it says subscribe. have done to celebrate the Stamp Simply Birthday Party. Congratulations Sharon on your 100th blog post for Stamp Simply!!! 11. Joan- Birthday Card and Etched Glass with BLOG CANDY (that's me). WOW! I want to win this blog candy! Really, I do!! Can I come back and enter often?! OK, I'll behave. Great job by the way. And I wanted to ask you to come and join in a new Challenge - at http://ssdschallenge.blogspot.com/.This first one ends tomorrow and there is candy too. Oh my Joan, this is absolutely gorgeous! Love your card and your etched glass. My favorite card making tool has to be punches!! I love all the shapes available! Thanks for the chance to win!! Okay, this blog candy has my name written all over it! Really I would like to win. My favorite card making tool would have to be my cuttlebug. I don't have a big shot but use my cuttlebug all the time. Love your blog. Oh my gosh -- gasping for breath -- jaw on the floor! Joan, this project is beyond gorgeous!!!! Move over world -- here comes Joan!!! WOW!!! Your project is beautiful.. I love the colors! I am a subscriber, and you know me by another name (Noreen). Hmmm, favorite card making tool... it's hard to pick a favorite! I love my ScorPal and my Nesties, but couldn't do without my papercutter. Your card and potpourri holder are so cute!!! I would love to win a set of Justrite stamps. I've been wanting to buy a set for a long time and if I win, then maybe it will help me decide other sets to buy. Thanks for the chance!! My favorite tool is the Cuttlebug and the Spellbinder Nestabilities! I just got a Scor-Pal and I'm loving it too! So many great products are available now!!! Your card and etched bottle are awesome Joan, simply over the top. My favorite cardmaking tool is my cuttlebug. I love all the embossed backgrounds and use it often. Your work is so lovely Joan - I really enjoy your blog. Now what would be my favorite tools - I think right now it would have to be my Cuttle bug but from the "olden days" I still love embossing with my heat gun. I am still amazed how it just melts and takes on a new look. Thats what got me hooked on stamping 16 years ago. Joan, this is a knock-out card and I love how you have the flowers standing out, it is just beautiful. Your etching looks great to me. I think my favorite tools right now are my stamps and TomBow markers. Nestie are a close second. Joan your card is gorgeous ! I love the layout, the colors, the Fleur de Lis pendant and everything about it . I never thought of using the Dahlia nestie with the JustRite set the way you did. That is a great idea!! 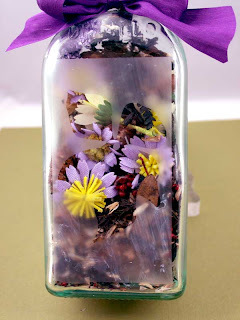 Love your blog candy and your etched glass project! I love my embossing folders especially the textile texture and swiss dot. Favorite tool for cardmaking would have to be I guess my stamps. Are they considered a tool? If it isn't then I'd have to say my good old paper cutter. Can't make a card without it. What beautiful projects Joan - your card is perfect. Wow, this is very cool---I have read about etching but never tried it! Your creation is just beautiful! TFS! My favorite tool---ooh, that's hard, I guess my nesties--they make everything extra special and they are SO easy to use! Your card and the etched glass are gorgeous - I love those colors!! My favorite cardmaking tool is my cuttlebug - it enables me to use all my other cool tools! Wow beautiful card and etching project. My stamp a ma jig is still one of my all time favourite tools - I use it all the time. Thank you so much for the chance to win this wonderful blog candy. Awesome blog candy. Iread your blog in Google reader. Thanks for shring the candy. My favourite is my cuttlebug with Nesties!! OMG! Those are absolutely gorgeous, and I need to try the etching, you did a beautiful job. thanks so much for sharing. I have just subscribed so I will be able to come back more often. Love the new Just Rite stamps and your card is so elegant. Oh, my. Your creations are so beautiful! It's hard to say what my fav card making tool would be but I think it is my cuttlebug. Awesome blog candy you are offering. You are so generous. Joan, your card and etched glass vase is beautiful and so elegant!! I can't believe it is that quick! Thanks for sharing your project, and the opportunity for your wonderful blog candy! WOW! I love your blog candy! My favorite stamping tool would be my Cuttlebug which I use daily. Can't wait to get the new embossing folders. I visit your blog every day and just subscribed today. Would love to visit your store some day, too. Please use the email address below my name. Thanks. What a great set! 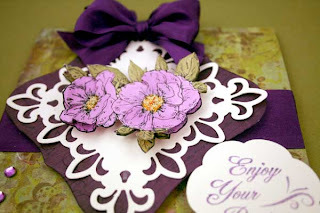 I love the detail and dimension on your card! I have your blog in my reader so I'm updated! Happy 100th Stamp Simply Challenge! stunning card and gift. very elegant. thanks for a chance to win this great blog candy. oh my favourite card making tool is my cuttlebug. it just adds that little extra zing to any image.great card. win this wonderful "craft candy"
Spellbinder dies. I just LOVE them! Looking forward to your new cards from your emails. Love that Fleur de Lis frame. Just makes the whole card POP! I would love to be the winner of your blog candy and try the stamps. They are new to me. Thanks for the chance. The card and vase are beautiful in my favorite color. My favorite tools are the Spellbinder dies. Hi Joan, I have found it hard to pick just 1 item,but in the end i went with The Big Shot. It has to be the thing i would miss most if i was no longer able to have it. I use mine for so many things. One of my favourite tools to use is the Glue Glider PRO. I enjoyed your card, very pretty. Beautiful project, Joan! Glass etching is one of those things I want to try and haven't done yet. And what great candy, too - I LOVE JustRite stamps. Joan, thanks for sharing! Your card is beautiful. Congrats on 100 challenges! Thanks for the chance to win the blog candy! Excellent card, luv the flowers! Sharon referred me to you, I just signed up for your newsletter. What fun I have had blog hopping through all of these amazing cards and projects! Loved visiting your blog and hope I'm lucky enough to win your amazing prize. What fun it has been doing this blog hopping! All of you have such amazing talent. Love this etching on the glass. Love your coordinating card as well. What a GORGEOUS gift set!!! Of course I just LOVE the purple but I clicked for a closer look and was VERY impressed with your etching ... hard to believe it was your first time! Well done!!! Looks AWESOME!! Ya done good girlie ... LOL!!! Beautiful card & etched glass. My favorite card making tool is Spellbinders dies. I also love JRS & Basic Grey. I also became a follower of your blog. God bless! What great Blog Candy! Thanks for the chance to win! I really love your hetched glass and your card. Thanks for giving us a chance to win this great blog candy. Your card and etched glass bottle are absolutely gorgeous, Joan! Thanks for sharing and thanks for the chance to win the wonderful blog candy! My most used card making tool has to be my Cuttlebug! Couldn't be without it! My fav is my cuttlebug- I love the way my cards turn out looking so professionally done. The nesties and sizzix work great with it. BTW-Your project turned out beautiful! Wahoo! Wonderful inspriation!! GREAT blog candy! Thanks for the chance to win. My favorite card making tool has to be the Nestabilities - the new shapes are awesome. Now this is one awesome card and gift. Love the colors and all the details. Thanks for this inspiring eye candy. I just subscribe to your blog. I don't want to miss any of your creative MOJO! Wow you sure know how to celebrate with this sweet and fun candy. Thanks so much for a chance. Oh my Joan, how generous...and how happy I would be if this gift came my way!!! Your etching is perfect. I clicked on it and could see it close up! Just lovely, as is the card. I love buying from you...I feel like we literally "know" each other! Thanks for the chance to win!! WOWZERS!!!!! What a lovely gift set! Someone is going to be very lucky to receive this! Thank you for a chance to win some awesome candy! My favorite tool right now has been Nestibilites die. Joan - the card is beautiful!! I am just getting into using the Copics and learning how - your coloring is fantastic! And, I just got some of the etching cream, but haven't tried it yet - so you are inspiring me with 2 new tools! Thanks for the opportunity to win this blog candy! Hermosa tu tarjetas y tus trabajos!Soy de argentina y la verdad es que aqui no hay esos materiales pero me encantan los sellos e imagenes!Gracias por dejarme participar!Saludos! Joan, your card and bottle are just stunning. Beautiful!! My favorite tool has to be my Big Shot. Between the nesties, and the cuttlebug folders, it gets used for almost every card. OHHH lA LA! GREAT BLOG CANDY AND GORGEOUS BLOG. I AM SO GLAD I OPENED YOUR THREAD ON THE BOARDS!! My favorite tool is a simple one but most used.... my Scor Pal. Love that thing!!! Great project Joan! Just lovely! As is your candy. I have become a subscriber. Thanks so much for the chance!!! Absolutely gorgeous...love it! Thank you for the chance to win your blog candy! My favorite tool would have to be nestabilities and also me cuttlebug right now. The stamp set is great and enough but your making it an extra treat! I have never used the JustRite stamping system, and winning one free would be a great way to start! Great Blog candy!!! As always your projects are awesome. I think this is the best blog candy I've seen so far. Thanks for the opportunity to win. My email address is okcorowell@bellsouth.net ! Beautiful project Joan! I've always loved the look of etched glass! Pretty fabulous blog candy you have going as well! What an elegant gift, and I love the etching-something that I have been wanting to try forever. Thanks for your instructions. What is my favorite card tool? After a long thought it has to be my Copic markers with the Just Rite Stamps as a very close second! What a beautiful job you did - I'm really impressed! Your etched glass is gorgeous! As to my favorite tool, I still love to emboss with my heat gun. This method got me hooked and I still am amazed when I see the results! I love the new border punches that are coming out. Thanks for the card and the amazing candy. You are very kind. Joan, you have done it again!! These are fantastic goodies!!! Thanks for such a great blog and for sharing all your terrific projects!! What a gorgeous card & gift! My favorite card making tool would be border punches....there are so many pretty ones. Thanks so much for the chance to win some fabulous goodies. I am signed in now. Are you ready for more comments from me? I love your card and all the entrants to the anniversary challenge. My favorite tools are my SU stamps. All the other things are necessities. Hand up, waving, choose me, choose me. Love the card and the bottle. My fave. tools are cuttlebug, nesties, all my folders and my justrite stamper items. So Pretty!! Great tutorial! I hadn't seen this yet and what a beautiful idea!! oops I forgot to tell you my favorite tool - at the moment it's a toss up between my border punches and my cricut!! Beautifully elegant card and project. Thanks for sharing! Your creation is GORGEOUS!!! Do Copics count as a favorite tool? I can hardly make a card without adding them in somewhere. Gorgeous card and project. Thanks for the chance to win some blog candy. Oh Joan, your first attempt at glass etching turned out so pretty!!! TFS the tutorial, I may have to try that now!! I love the rich purple colors you used and everything is just gorgeous!! Great blog candy! Thanks for the chance to win. What a great job. I love the color combination of purple and green and you did a great job. Glad you used the Flower Soft too. The tool that I absolutely couldn't live without is the Cuttlebug. Thanks for the opportunity. Beautiful card and bottle. I've never tried etching. Maybe that should be my next thing to jump into! Thanks so much for offering such wonderful candy. My favorite tool is my Cuttlebug and folders, but I've just gotten a Corner Chomper. It might just take over first place on my list. Stunning purple bows...what would we do without the bow easy? Love the artwork....thanks for the opportunity to win something. I love that 1st comment! Tee-Hee!!! I too want to WIN!!! I am going to become a subscriber now too (should have done that a LONG time ago)!!! Joan, this blog candy is awesome. The projects that you did and the other people too are so beautiful. Makes me want to have everything shown. What a beautiful gift set! Thanks for the chance to win! The etching looks fun! Will have to try that sometime...favorite cardmaking tool has to be my border punches and cuttlebug. I used them nearly everytime I make a card or other papercrafting projects. Thanks for the chance! Wonderful job on the etched glass and the card is wonderful! Joan, Your project is beautiful! I love the colors and the whole idea is absolutely stunning. Thanks for a chance to win some "candy"! I love etched glass, I use votive candle holders quite often. I have to say my favorite tool is my Cuttlebug, with the embossing folders the most. Hi, Joan: What a beautiful set! I love to work with the Cuttlebug. Thanks for the opportunity for the blog candy! Wow- thanks! I have to say that my favorite card making "tool" is my Cuttlebug... don't know how I lived without it, lol! I like layered cards and using the Cuttlebug. Love your project today. Thaks for a chance to win. I love, love, love my Nesties! Your samples are just gorgeous! Thanks you for the most generous offering of blog candy! Beautiful card and etching. I'm a little nervous to try etching, but I love your project. My favorite card making too is definitely nestabilities (please don't make me choose which set though). What a beautiful card and a great project!!! The person who recieves this gift will be one lucky person!! What a great idea!! Great candy too, thanks for the chance to win!! Joan, your card is over the top gorgeous! Love it! As for my favorite stamping tool - gosh, there's three I couldn't live without - my ScorPal, Big Shot and Bow Easy. Thanks for sharing your talent with all of us. Beautiful card and jar. Purple is so vibrant. Great job. This blog candy sure looks yummy. Thankyou for sharing your design expertise so gratiously. I've learned so much. Lovely blog candy too! I love my cuttlebug. I don't know what I would do without it. I'd love to win this blog candy! Thanks for the chance to win. Such elegant projects Joan! Beautifully done! What a beautiful card and etched bottle. You are very talented. Love that blog candy also. I love using my cuttlebug and spellbinder dies. I have to say my favorite tool right now is my cuttlebug. Love, love, love it and all that it does. Love your blog, Joan. What a pretty card, Joan, I love the colours and beautiful details. My favorite tool are my Spellbinder pendants and nestabilities. Your card is so very beautiful. Thank you for a chance to when your yummy blog candy. Hi Joan,, Love your card!!! My favorite card making tool is my Cuttlebug embossing folders that I use in my old red sizzix. Love your projects. My current favorite card making tool is the Martha S. lace border punch! These are absolutely GORGEOUS, Joan!! Wow... just gorgeous! Favorite tool? That's hard, but I think maybe my big shot... use it a LOT. Thank you for the opportunity to win. God bless. Favorite tool? I would have to say my cuttlebug and nesties. Use them on nearly every card I make. And yes, I already subscribe. Love the etched bottle it gets my head just a spinning for christmas gifts.The card is stunning also. I would love your blog candy. Hi Joan, my new found absolute favourite card making tool is the Pro gue glider. It works so smooth and easy. I wouldn't want to be without. Hope I win the blog candy! Luv your card with all the purples. my favoite card making tool is my prisma color pencils with mineral spirits and paper stumps, for colouring stamped images. I am adding my self as a follower! I love your blog! Wow, what a gorgeous birthday ensemble! The card is so beautiful (purple is my favorite color!). My favorite card-making tool(s) would be punches. I love punches! Thanks for the chance to win your awesome candy (I also love JRS!). I became an E-mail subscriber. My favorite tool is the cuttlebug. Joan, the card and bottle are stunning. I love Victorian, and they make me think of that era. I signed up for e-mail updates for your blog. Favorite tool is my Cricut Expression. I just started making cards and I love my bone folder. It makes the creases so crisp. Thanks for the candy. anything for blog candy, but a question is so easy or is it? I love my spellbinder and my cuttlebug do I really need to choose between them? Probably my Cuttlebug, but I really don't like choosing! Lovely projects Joan... yep, became a follower too! Thanks for the chance to win the blog candy.. You are very generous!! I have to say my favorite tool has to be my Nesties...I just love using them! I will subscribe today too! I get so excited whenever I see anything in royal purple - yours is fabulous! Thanks for the chance to win some great blog candy. My favorite tool is my cuttlebug! These projects are so delicate and beautiful. Hope I win. Joan, this is a fabulous project, and rather enabling, too, I must say! Love all the products you used, especially those Spellbinders shapes. Oh, I'll just never have enough STUFF! You're sharing some lovely candy, too. Thank you! Beautiful card and jar. I love the use of the fleur-de-lis with purple!! My favorite tool has to be my big shot, so I can use my nesties, but then again I really use my paper cutter first! Thanks for a chance to win some candy! What great blog candy! I don't have many tools, but I love my cuttle bug and punches. That purple is so intense and beautiful.Very pretty. Oh how I would love to win the candy. I have been wanting this set but waiting until everything is purchased for the last little bird to go off to college. I visit often. I think it is the layout and design of your blog as well as it's content. Thanks again for the chance to win. Love my Cricut I recieved for my birthday! beautiful work and thank you for the chance at some yummy blog candy! Favorite card making tool? Would have to be punches and Spellbinders dies. Awesome card! Those flowers are spectacular! Joan, your card is stunning! LOVE those beautifully Copic-colored flowers and the pendant Nestie is the perfect backdrop for your flowers. And the etched glass bottle is beautiful! I will have to give that a try sometime! Oh, I love this particular Just Rite stamp set. (And of course your card and etched glass are incredible.) Thanks for the chance to win! Oh, how lovely! Almost as pretty as your gorgeous garden! My favorite tool has to be my Scor-Pal, with my punches a close second. I'm already a subscriber and so enjoy all you share! What a generous offering of candy! Yummy! Joan, your card is absolutely gorgeous! Very elegant and stunning! And your Etching is beautiful! What great projects! I would have to say my favorite tool would be my border punches, I love making pretty borders on my cards and use my border punches quite a bit! Thanks so much for the opportunity to win this fabulous blog candy! My favorite card making tool: My BigShot and embossing folders/Spellbinders Dies. Hi Joan from Canberra Australia - I love your card - gorgeous, as is that candy you are offering - my favourite tool would have to be my SU Chalks/Pastels, followed closely by my Cuttlebug! Thank you for the opportunity to play. Thanks again! God bless you! Your glass etching is fabulous! Thanks for the chance to win some fun blog candy. Oops I forgot to say in the previous post that my favourite cardmaking tool is my Cuttlebug, together with the embossing folders. At the moment, the favorite card making tool is the Scor-Pal; love what I can do with it! The June Bug collections is so CUTE! I found some paper last week, but would love to add embellies, so here's hoping I win! Thanks, Joan! This is one super fab card, Joan! One of my faves you have ever made... so much depth- just fab from top to bottom!!! My favorite card making tool is definately my nestabilities. I used them a lot! Love the etched glass. I've made a few etched gifts myself and enjoy it. Thanks for the chance to win this great prize. I'm a subscriber too! My favorite card making tool is my Cuttlebug used with Nesties - (or is that 2 tools!?!?) If that counts as two then I would say my CB is my fave - I can't live (or stamp) without it. It is difficult to choose just one tool as my favorite. Guess I wouldn't want to be without my paper cutter! Thank you so much for the opportunity to win this blog candy! What a gorgeous gift set you`ve created Joan! I simply love the colors you have used. The etched glass bottle is lovely! My favorite tool at the moment would be Copic markers. Thanks for a chance at some terrific blog candy! What a beautiful project and card! So elegant with the ribbon and spellbinder die. My favorite card making tool is my mat pack and paper piercer. You had me with the rich, deep purple and crisp white used on your lovely card. Can a computer be considered a stamping tool? If I spent as much time stamping as blog hopping, Halmark would steel my supplies. The blogs inspire me to use my cuttlebug and nesties. My favorite tool is my Cuttlebug but I'd also be lost without my paper cutter. Thanks for the chance to win your fabulous prize. Your creations are just stunning! Gee, my favorite tool? That is a hard one! I LOVE so many gadgets and tools. I guess I can narrow it down to 2: my Wizard with all my Nesties and my Gluerider. But these would do me no good without my beloved stamps! Thanks for a chance to win some great blog candy. I really like the embossing folders. Thanks for the chance to win! Both these projects are so gorgeous Joan. My favorite card making tool has to be my Cuttlebug so I can use my Nesties and embossing folders. Beautiful creations! I LOVE them BOTH! I guess my fave Cardmaking tool right now is my Cuttlebug. I can use it with EVERYthing...lol! Thanks for the chance, and I am a new subscriber! cuttlebug. Use it all the time. Love your card. Etching was nice,too. You have been such a great friend to Sharon and her to you. I look at your blog several times a week. I loved seeing pictures from your recent trip, it looked like great fun. Fabulous card Joan! Love the pretty flower and the pendant background... I think right now the Spellbinders dies are my favorite tools.. along with my cuttlebug machine. :o) TFS! Love your project!! It is a beautiful set. I have been wanting to try etching on glass. My favorite card making tool is my new Scor-Pal. Love ur website Joan. My favorite card making tool, sorry I can't pick just one would have to be spellbinders, cuttlebug, and soon to be Justrite stamps. Thanks Joan for a chance to win! I love to use my Big Shot, Nesties, punches, embellishments.....oh so many things for making cards. I don't have a special place to "create" so my dining room table is covered with ideas! I do not have a blog, but I just subscribed to your updates. Your card and coloring is awesome!! My favorite card making tool would have to be my nesties and e/folders. I would be very happy to win your blog candy! My favorite card making tool is my Cuttlebug! CUTTLEBUG EMBOSSING FOLDERS. IT MAKES FOR SOME INTERESTING BACKGROUNDS AND DRESSES UP THE CARD. 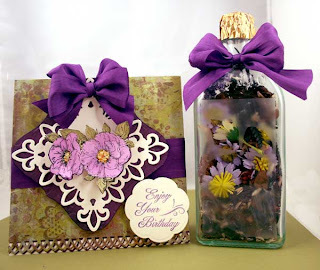 Wow, this card and jar of flowers is beyond gorgeous! I'm going blog hopping because I am a fan of Stamp Simply big time! My favourite tool, I have a few... I think my tonic guillotine paper cutter. I love straight cuts to begin with! I'm a subscriber and boy would I love to win some JustRite and paper too! Thanks for your inspiration, Joan.